The first two 13.5 metre VDL’s in Scotland are now on the road with Allan’s Coaches of Gorebridge the proud new owners. 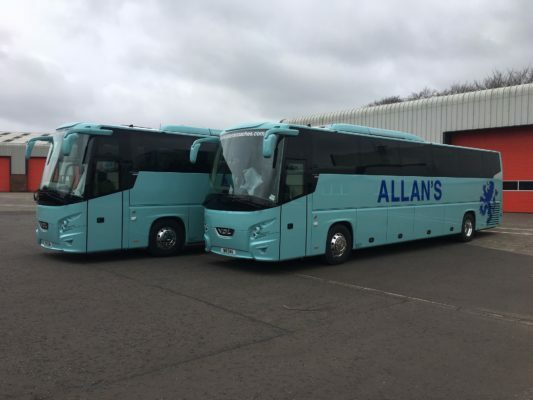 The Edinburgh Company have taken delivery of these 61 seater vehicles which have an astounding 12.5 cubic metres of luggage capacity, and plenty of power with a DAF MX 11 370 HP, Euro 6 engine coupled with a five hundred litre fuel tank, and a ZF ecolife, fully automatic gearbox plus retarder. Inside, the vehicles look the part with partial leather seats plus black driver and courier seat, three point belts and armrests. Passengers will love being entertained with the latest Bosch DAB radio PA system and two 19 inch flat screen monitors and will find the USB ports for all the seats handy for charging their phones or laptops. The coaches also include adaptive cruise control, a rear view camera, VDL’s three years or 300,000 km full warranty as standard, alloy wheels, centre sunken toilet, centre continental door, fridge and water boiler, a sleeping bunk and loading lights.